and distributed by Parker Brothers. 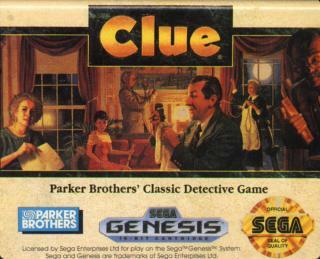 every other platform's version of Clue. Dull and boring. 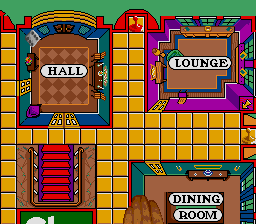 I get more of a kick playing the original board game. everyone favorite classic board game gose sega but this time there is alot better graphics and sound.. beats the heck out of setting up the cards and the board everytime you wanna play! 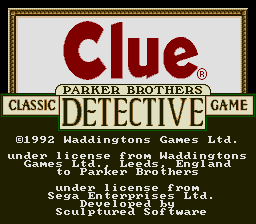 i wonder why they shortened it to clue ? Good game though. Better with more than 1 player !!! 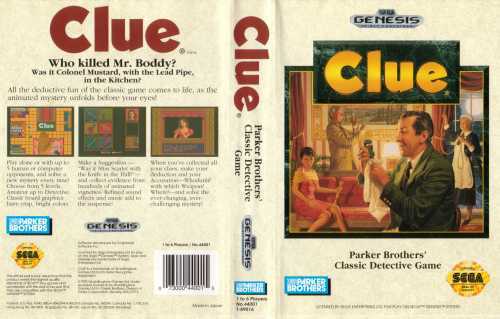 Clue Should Be Re-Released For Playstation 2, X-Box, Nintendo Gamecube, & Game boy Advance. The Rules are that if you Go into rooms like The Study, Lounge, Library, Kitchen, Dining Room, Conservitory, Ballroom, Billiard Room, or the Hall, you say What Weapon it is a Knife, Revolver, rope, Wrench, Leadpipe,or a Candlestick. You Also say what Suspect it is Including Mr.Green, Col.Mustard, Professor Plum, Miss Scarlet, Mrs, White, or Mrs Pea*. Whoever Solves this Case file Correct Is the Winner. Its For 1 Or 6 players only.